Do you get the newsletter “Teach This Poem” from Poets.org? If not, you should definitely go sign up. I don’t always find time to implement each plan, but they are great for tucking away to fill in lesson plans at times. What I like about the plans is they incorporate other disciplines, such as art, history, or science. Students have a chance to discuss and write in each lesson. Some time back, the lesson plan revolved around Lucille Clifton’s poem “blessing the boats.” Please check out the poem at Poets.org.I don’t want to reprint it here without permission. I have even set the link to open up in a new tab, so you don’t lose your place. Come back, because I have more to say. 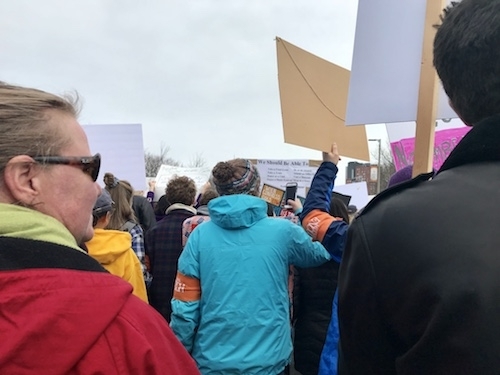 In recent weeks, students around the country have become activists and are leading campaigns to change minds and laws. Ask your students to write about how this poem might relate to the context of student activism today. Ask for volunteers to read their writing to the class. 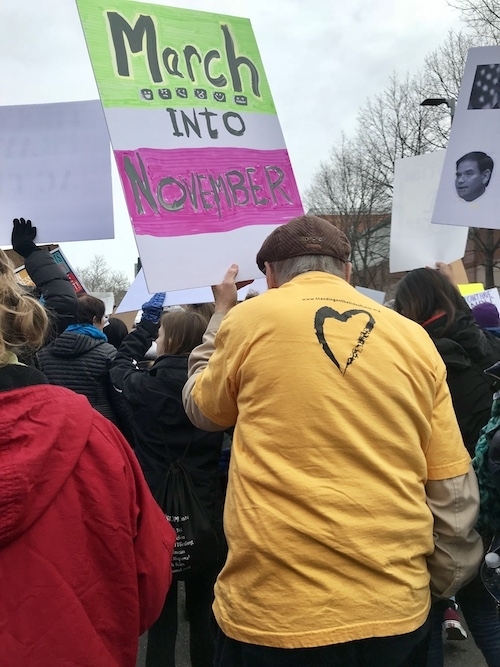 Yesterday, I joined student activists and their allies at the March for Our Lives in Boston. It was a powerful and meaningful event for me. I haven’t ever done something like that before, and that was one of the reasons I went. I feel strongly about the issue of safety and schools, and I have ever since I was in college, preparing to become a teacher, and we first started hearing about school shootings. 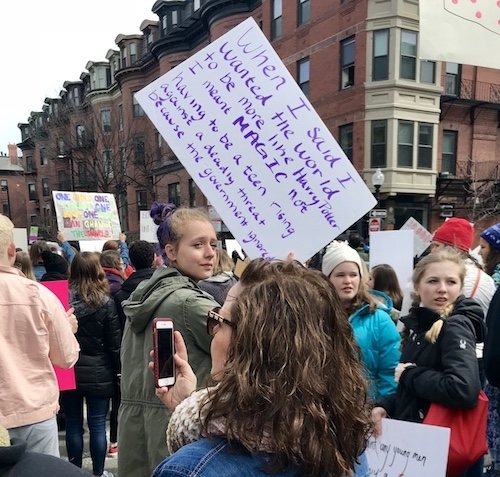 The organizers asked that adults hang back and let the students start the march, which began at Madison Park Technical Vocational High School in Roxbury and ran mostly up Columbus Avenue, ending with a rally at the Boston Common. During the rally, speakers included Leonor and Beca Muñoz. Beca is an alumna of Marjory Stoneman Douglas High School who now attends college at Northeastern and her younger sister Leonor is a current MSD student who survived the shooting. Leslie Chiu, another MSD alumna who also attends Northeastern, spoke as well. Harvard University student Reed Shafer-Ray lost a friend to suicide and spoke about a couple of bills before the Massachusetts legislature that might have helped save his friend’s life. Graciela Mohamedi, a teacher who was a former US Marine spoke on behalf of teachers, including highly trained teachers such as herself, who do not want a gun. A former child soldier from the Democratic Republic of the Congo also spoke about escaping from violence—I regret I didn’t get his name, and it would seem none of the news outlets covering the event did either. If someone finds it, let me know in the comments, and I will update this post. This was my view as I began marching. It was heartening to see so many people coming out to support our young people. 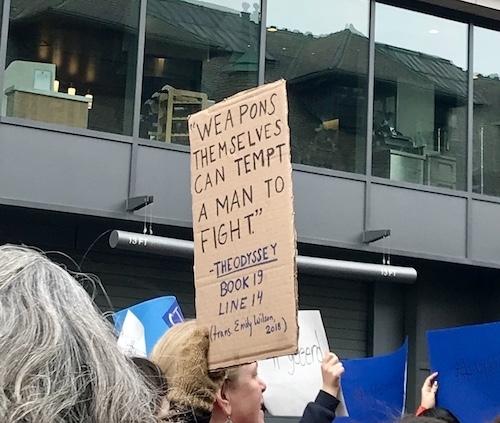 These adults were, as Clifton describes in her poem, “blessing the boats.” This is not going to be an easy fight for them, but based on what I’ve seen, they have got this one. There were volunteers registering people to vote at the rally. I can remember being in college and being fired up to act politically for what I believed in. There is a lot of energy in these young people. There is some energy in their allies, too. I could barely keep up with this guy, who started out right in front of me at the march but outstripped me somewhere along the route. The English teacher in me was happy to see literary references. There were definitely a lot of teachers there. I was behind three teachers talking about Paulo Freire near the beginning of the march. I’ve been criticized before for being political on this blog. I’m supposed to shut up and share lesson ideas, I guess. Freire says, “Washing one’s hands of the conflict between the powerful and the powerless means to side with the powerful, not to be neutral.” I’m not going to side with the powerful against my students. Freire also says, “This, then, is the great humanistic and historical task of the oppressed: to liberate themselves and their oppressors as well.” As far as I’m concerned, I’m with the kids. I’m just here to bless their boats.